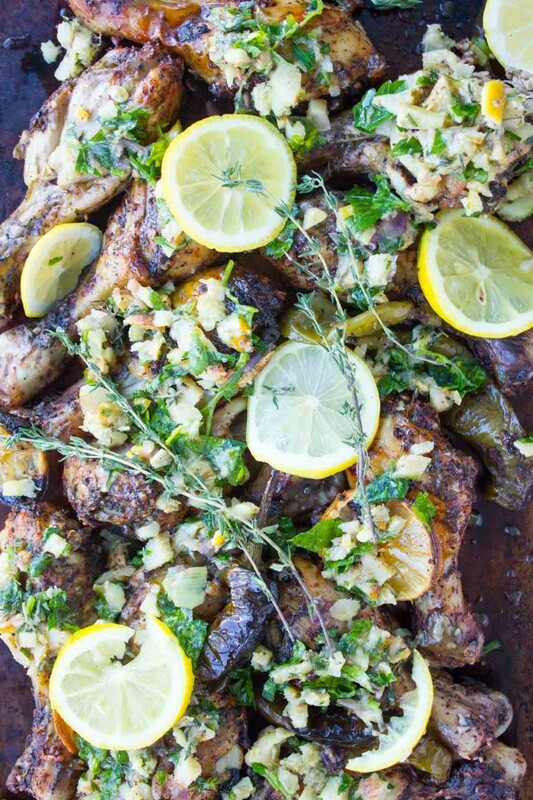 This Lemon Artichoke Garlic Roast Chicken with Salsa recipe is a fresh take on roast chicken. Chicken drumsticks are roasted till perfection with lemon slices, chili peppers, garlic, and artichokes. A roast chicken recipe was way overdue here! Now I know roast chicken doesn’t necessarily shout Spring, but with those lemons, artichokes, garlic, herbs, and salsa.. it absolutely does! 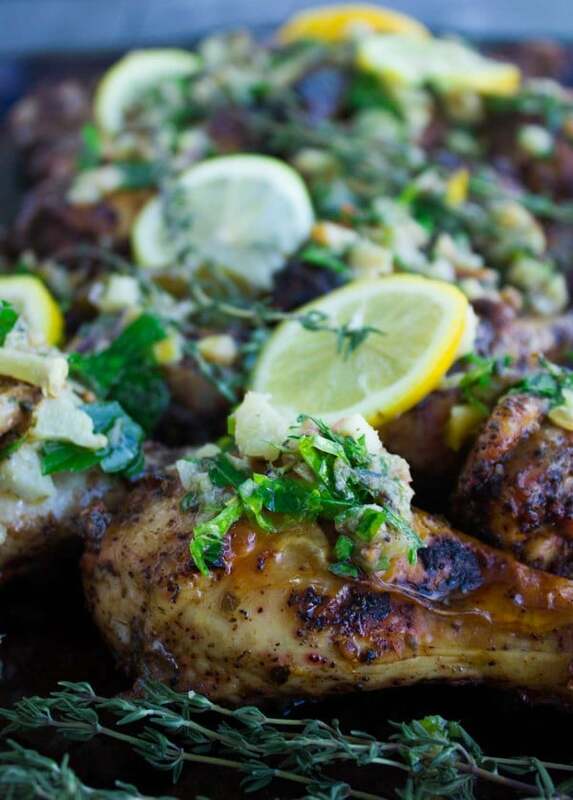 This Lemon Artichoke Garlic Roast Chicken with Salsa recipe is a fresh simple take on roast chicken. Chicken drumsticks are roasted till perfection with lemon slices, chili peppers, garlic, and artichokes. Tangy, spicy and very garlicky, this is perfectly tender roast chicken with a very crispy skin. All covered in a fabulous chunky salsa which is made in 2 minutes using the same lemons and artichokes roasted with the chicken! The perfect easy sheet pan dinner for weeknights! The best things about this freshened up Roast Chicken with Salsa recipe is that it needs very little prep time, and the oven does most of the work for you. I opted for chicken drumsticks for my chicken with salsa recipe, but a whole chicken (cut up preferably to infuse more favor) or bone-in chicken breasts work just as great! Before roasting, the chicken is coated in a mixture of garlic, capers, as well as sumac spice. Then, it’s placed on a baking sheet with plenty more garlic cloves (whole), lemon slices, fresh thyme leaves (or dried if you don’t have fresh), chill peppers, artichoke hearts, and sliced onions. Once the garlic roast chicken is done, take out the sweet, roasted garlic cloves and mash them. Then chop the roasted lemon slices, artichokes, chill peppers, onion rings. Add to them a little more sumac, plenty of fresh parsley, cilantro, mint (or any fresh herbs you have!) and a drizzle of olive oil to ing this salsa together. And you’re left with an unbelievably flavorful easy salsa! Dollop it on to the chicken pieces for an extra wow factor to the humble roast chicken! So while we’re still on the salsa, I have to mention that his fabulous roast chicken with salsa reminds me of my mom as she is the queen of sauces and salsas. When she’s absolutely rushed, she’ll roast chicken with different veggies, then blend them up with a little cream and turn them into a nice smooth sauce – voila: Roast Chicken with Salsa for dinner. And this is exactly what you might want to do here. Take the wonderful roast garlic, lemons, artichokes, onions, peppers, fresh herbs and blend them up in a food processor. Add a little broth or cream or both and turn it into a luscious salsa for your chicken! For today I felt I needed a chunky rustic fresher take on sauces so I went for the chopped salsa. Let’s talk sumac: If you’re not familiar with this spice, it’s deep dark red in color and has a strong lemony tangy taste. You’ll find sumac in the spice section of most grocery stores, ethnic stores or online. 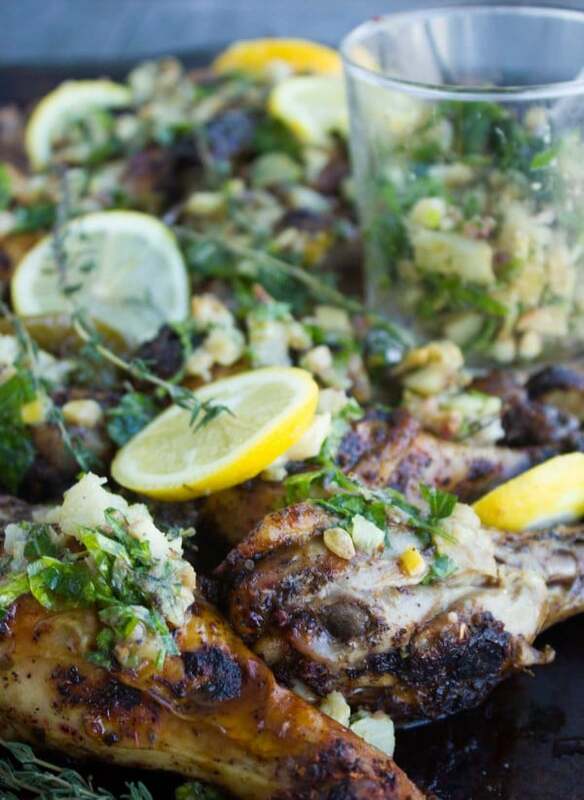 I strongly recommend you use sumac in this roast chicken with salsa recipe. But if you can’t for any reason, lemon zest may be substituted. Let the chicken rest, while you make the salsa. This gives the juices time to reabsorb into the meat and stay there while you cut it. 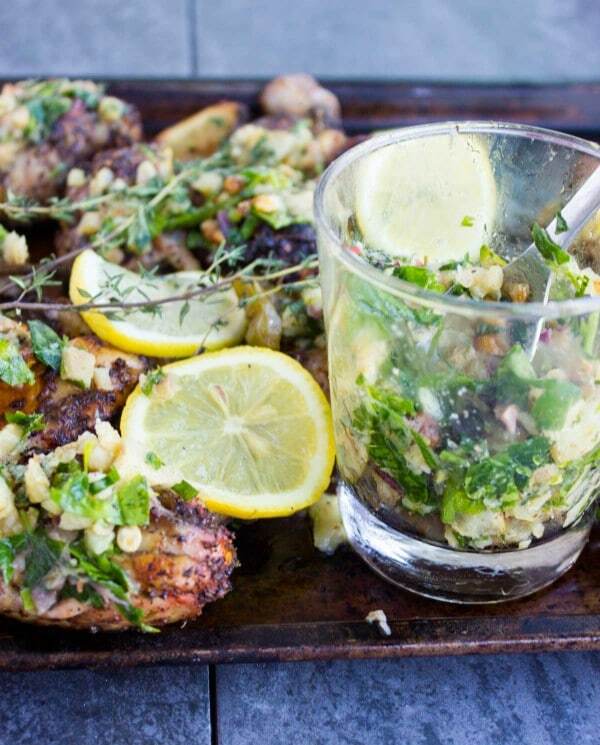 This Lemon Artichoke Garlic Roast Chicken with Salsa recipe is a fresh take on roast chicken. Chicken drumsticks are roasted till perfection with lemon slices, chili peppers, garlic, and artichokes, which are then blended into a flavorful salsa to serve with the tender chicken. 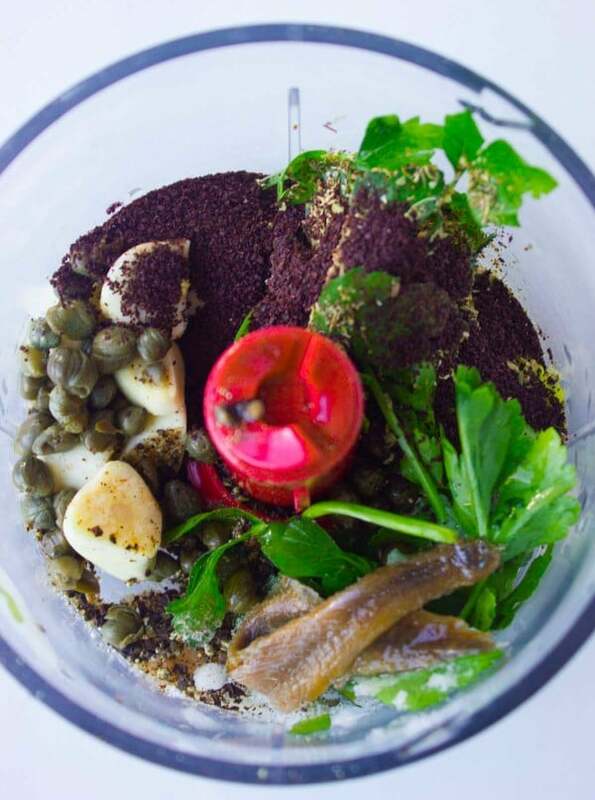 In a food processor, pulse the garlic, capers, anchovies (or soy sauce), spices, lemon juice and olive oil until smooth and toss the chicken with this mixture evenly. Spread the chicken in a single layer on a baking sheet. 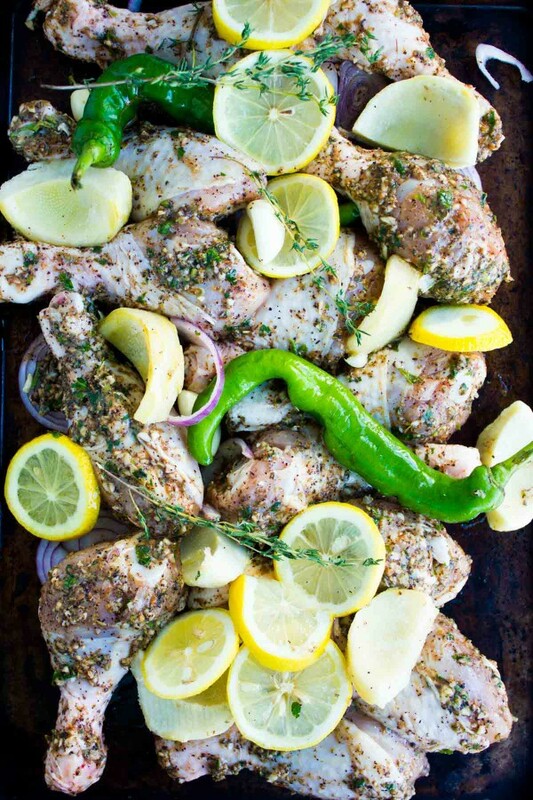 Take the sliced lemons, artichokes, peeled garlic cloves, onion and chill peppers and evenly place them between the chicken, under the chicken and over the chicken pieces. Roast the chicken for 30-40 minutes until done (depending on the size and cuts of chicken you chose). Let the chicken and veggies cool for a few minutes and then remove the garlic cloves and mash them gently in a bowl. Chop the roasted lemon and artichoke slices and add them to the mashed garlic, then chop the roasted onions and peppers and add them too. Add the fresh herbs, seasoning and olive oil to the salsa and mix it well. Put a teaspoon of chunky salsa onto each chicken piece and serve. Let's talk sumac: If you’re not familiar with this spice, it’s deep dark red in color and has a strong lemony tangy taste. You’ll find sumac in the spice section of most grocery stores, ethnic stores or online. I strongly recommend you use sumac in this roast chicken with salsa recipe, but if you can’t for any reason, lemon zest may be substituted. This sounds ah-mazing! What I can’t figure out is the artichokes… you say to slice but the ingredient list doesn’t say hearts or whole. Rasha, thanks for your comment–I am so glad you loved this! 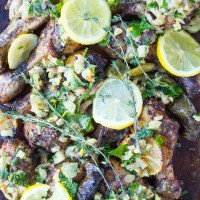 :) It’s a refreshing take on roast chicken!